A wolf-sized otter weighing close to eight stones once roamed the Earth’s ancient swamps, a new study revealed. The ancient species was almost as twice as large of present day otters and had features similar to an otter and a badger. It also had powerful jaws to crunch large shellfish and freshwater mollusks which would have been their main food. The otter named Siamogale melilutra lived some six million years ago and belongs to an ancient lineage of extinct otters, which goes back at least 18 million years. Scans revealed a complete cranium, mandible, dentition and various skeletal elements sheds light on the evolution of the little known fossil genus of the otter family. 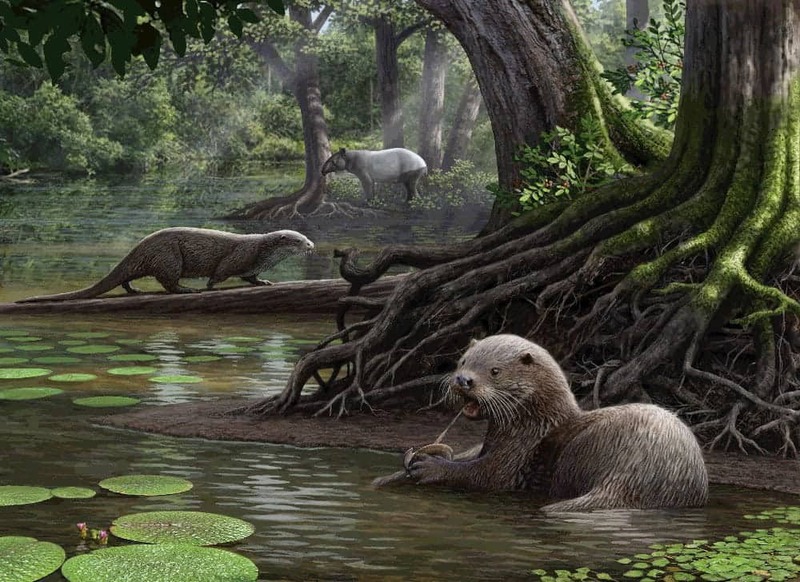 Curator & Head of Paleobotany and Paleoecology Dr Denise Su at the Cleveland Museum of Natural History said: “Otters (subfamily Lutrinae) are semi-aquatic predators in the family Mustelidae. “Modern otters have a worldwide distribution but their fossil record is poor, often consisting of fragmentary jaws and teeth. “Multiple lineages have developed bunodont dentitions with enlargements of molars, usually for cracking molluscs or other hard foods. “From the vegetation and other animal groups found at Shuitangba, we know that it was a swampy, shallow lake with quite dense vegetation. “While the cranium is incredibly complete, it was flattened during the fossilisation process. “The bones were so delicate that we could not physically restore the cranium. The CT scans revealed a combination of otter-like and badger-like cranial and dental feature. Because of this its species name was called “melilutra,” derived from meles, Latin for badger and lutra, Latin for otter. The study was published in the Journal of Systematic Paleontology.